Sorry I haven't written in so long. As you can imagine, things have been pretty crazy over the past week or two. I would have posted more but on the second boat I was on, the Osiris, I was having some trouble with the email. This blog is going to be like a short novel, but I figured you guys wouldn't mind. I'm back home now with no more plans to go anywhere too soon. Before I get going with all the happenings of the past weeks, I want to just let you all know how grateful I, and my whole family are for your support. It has really helped us recently. It's tough to be in the spot light of the media. While not all the media support me there have been a lot that have been kind and done a great job and I would just like to thank them for that. Things have already begun to calm down and before long there will be a new story for everyone to start following. It feels weird to be sitting at home in the office writing a blog. It feels like years since I've been here, and only days since I was wedging myself into my chart desk seat with my lap top writing in about weather conditions, getting excited over big blows and complaining about calm weather and the cold. so Ill just go over it all. I spent about three days on the French fishing boat, Ile de la Reunion. It was a nice boat and there were a few people that spoke English pretty well. There wasn't much to do on board for an English speaking young girl, but all the crew were nice and I enjoyed my time while I was on board. We got to Kerguelen Island around 4 in the morning. It was still dark so I couldn't see the island but the Osiris was right by us. They lowered their dinghy into the water and came over to pick me up. Almost everyone spoke a little English, but no one quite as good as on board the Ile de la Reunion. The first few days on board the weather wasn't all that great. We pounded along making painfully slow speed, but I didn't feel in a rush to get to land. Everybody on board was great. At first it was pretty cold and rough so pretty much everybody stayed down below. After awhile it started to get warmer out. We had a couple of BBQs on deck and brought out a bunch of lines and started playing around tying a bunch of knots and splicing lines, it was a lot of fun. The last few days were a lot like being back on the equator, plus 13 French men and a BBQ. The rough weather didn't last long and soon it was dead calm out and we were racing along making up for lost time. All too soon, there was land out the window. I was excited to see it but at the same time not sure of what to expect. It wasn't as bad as I had thought it might be. There was a bit of media waiting at the dock when we pulled in. I was glad to have Zac and a few other members of my team there because even with the help of the police, it was hard to w alk down the dock! We held a press conference there and it went really well. I hadn't spoken a long stream of English in so long that by the end of my statement I wasn't sure I wanted to stop talking! After that was all over we headed back to the hotel. ng. We got on a plane that night and got to Paris the next day. We had about a 4-6 hour layover there and decided that we should make the most of our time and go see the Eiffel Tower. We took a few trains to get there and got to spend about half an hour there and then took a few different trains to get back. It wasn't exactly leisurely site seeing, but it was fun, and now I have really been to Paris, not just through the airport. cameras after such a tiring few days and long trip. Back home there were a few people over; my team, a few friends and some of our neighbors. It was a nice homecoming - small, but nice. Eventually people started to leave, and I went to bed in my old bed. After a couple hours sleep Zac and I were up and on our way to the LA press conference. My mom had gone into labor earlier that morning and so she and my dad had to stay home. if we had a new brother yet. We did! Paul-Louis Charles Sunderland - big name for a little guy. From the press conference there Zac and I went to the airport where we hopped on a plane to head to New York for the Today Show. We got there pretty late, got to sleep a few hours and then went in for the show. It was a lot of fun and we met lots of interesting people. All the people at NBC were really nice. Zac and I spent the day walking around New York which was quite a bit of fun, but by the end of the day I had a pretty bad cold and was ready to go back home. The plane ride was somewhat miserable but at least it was short. We got home late but little Paul was awake. It was the first time Zac or I had seen the little guy. I couldnt touch him because I was sick, but I was able to view from a distance. So, we're all back here now with no plans to go anywhere soon. Every time I leave the house Katherine gets a little worried and asks when I'll be home. Well, that's all for now. I'll be back soon with some pictures and more news. Oh, Sweet Abby, It was so wonderful to see your latest posting. I am one of your biggest supporters and am so thankful that you've returned home to your family. 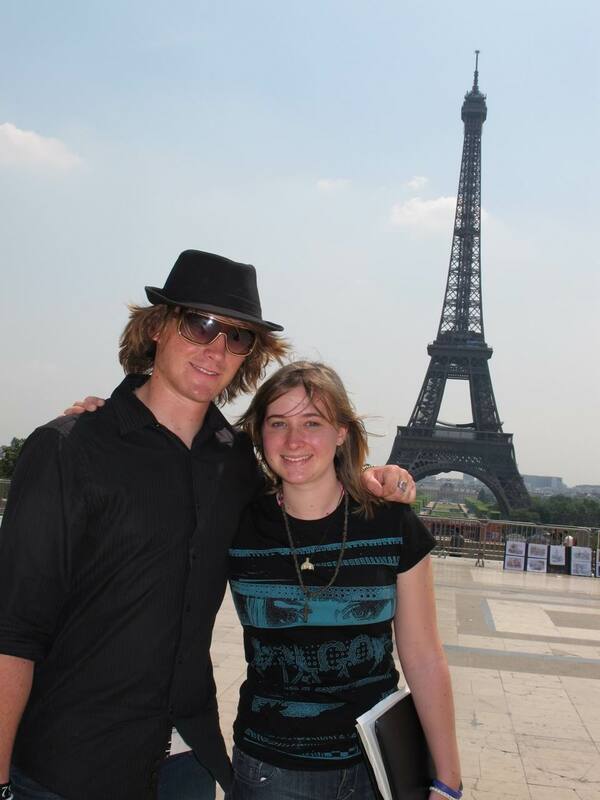 Great pics of your siblings and the brief site seeing tour in Paris. Welcome home, Abby and remember that we (your blog followers) realize that you've enriched all of us with your adventure and postings. Bud and Charla Winnett Wheeling, Mo. thanks for the update and pic's you included. It is nice to know that the family is all together. Keep on going and give us more when you can. I would like to hear about if the boat is still floating or is someone going to try and save it. What were you able to save off the boat. Most important, what are you going to do next? Congratulations on your little brother! Hope you'll rest for some time after this adventure! Will wait for more updates. Good to hear from you again Abby. Stay strong, stay safe. I look forward to reading more ! Dx. Hi Abby! Welcome home! I am thrilled to read your blog again, it has beens so long! Your writing style is fun and I always laugh a couple times reading it. I'm glad the press wasn't too bad. They have been somewhat of a disappointment during this whole thing I think. But I guess it comes with taking risks and doing extraordinary things. You have handled it all with class and style Abby. So has Zack and your whole family! I'm sorry about Wild Eyes. She was a tough little boat and you took care of each other when you needed to, right up to the end. But she did her job right, getting you home. She will be missed. But you are our Star Abby! Please keep us posted on what's next for you! And congratulations on your brand-new baby brother! It must be wonderful to be back among your family and to see your new baby brother. I've loved following your blog and will anxiously await your book or your next adventure--whichever comes first! I have to say again, you are an amazing young woman with an amazing family. Rest and get well from a fan in Maine. What a great blog Abby and I'm so glad we live only an hour away from you. I wish my dad was still living. We would have sailed over to Marina Del Ray in his 54ft boat to pick you up for a day cruise. You little baby brother is adorable and your sister too. I can see why you wanted to take her with you. Well, I'm off to take my kids to soccer practice now. Please write again soon! Very glad to see your home & with your family. I've been following but had not posted comments. You're a brave young woman, you'll conquer a lot with your strong independence!!! Welcome back I'm so proud of you Abs! I'm glad that angel on your shoulder watched over you and kept you safe all the way home. Congratulations to you and your parents on the birth of your new baby brother, you have quiet a story to tell him. I hope your life will settle down a bit now, but don't forget to dream your dream. Glad to hear the update. Savor the flavor of friends and family. One journey has been completed, it is time to prepare for the next (whatever that journey may be). Glad you are home and safe. I support you and all that you have done. You are still my hero!!! You sure have had an adventure!!! Not quite the adventure you wanted but still something to remember. Congrats to the family on the new baby! At least you were home to see him as a 'new born'. If things had gone to plan he'd be nearly crawling by the time you saw him so thats a positive. Good luck for the future whatever it holds for you now. Thank you for taking the time to write for us, Abby. Enjoy your family time and helping with the new, little guy with the big, long name! You're an inspiration for so many. Congratulations on the birth of your little brother! Such a beautiful baby!! I wish him health, happiness, love and light along his way in life! Give my regards to your parents, who must be extremely happy with him and proud of you!! What a great blog and lovely pictures. Baby Paul looks so cute. Enjoy being home with the family and I look forward to hearing what the future holds in store for you. It's wonderful to see you made it through everything safe and sound. Don't let the naysayers get you down, you're a bright girl with so much in store for you. keep on pursuing your dreams! What splendid writing style. What fabulous telling of story. And to think that Zac has no lesser bragging rights than you! When the two of you walk into a TV studio together, you two no doubt fill that place. I bet others necessarily take pause in that moment when they meet you two, and ponder on their own lives and whatever maybe they've done, if anything even noteworthy at all. You give fresh meaning to the word, "inspiration". Thank you. Thank you. Abby! I'm grateful for your personal update!! I have left some posts here anonymously, & I just want to encourage you again to keep doing hard things. I understand that your family home schools, & from a former hs, who currently homeschools 2 young children, I just give you kudos for what you are doing!! I mentioned in a former comment the book by Alex & Brett Harris, "Do Hard Things". I am so glad to see a young woman such as yourself "doing hard things"! Congrats on your new baby brother, too! I myself am the oldest of 6, with 3 brothers & 2 sisters. I know what a joy & a treasure family is! Have a great summer!! Great to hear that you're safe and that the trip home wasn't too bad. And good to hear that the press was relatively nice! At least you don't have school to go to, so you can relax and catch up on some rest : ) Do you know if there's any possibility of getting Wild Eyes back? If there's anything I can do to help, please let me know! And I'm glad that your baby brother is well. Anyway, just wanted to welcome you home again, and I can't wait to hear about your future adventures! so glad you are home! your little brother is adorable! blessings to you and your family! Thanks for the update and best of luck with your new adventure. You certainly are an inspiration to generations both young and old. Take care. Wonderful to hear from you again Abby... in your calm but SO alive way of writing. You truly are a great writer... though I know you'll balk at that and try to dismiss it as just a compliment. Your writing style is like you: honest, up-front, unassuming, polite, and INTERESTING. I am praying that you find the time and motivation to write a detailed account of your adventure... full of insights on what you felt and what you learned along the way. Writing is not easy, even for good writers... maybe especially for good writers. Because they always struggle to bring forth the truth which sometimes is hard to put in words. Please try. Welcome home, Abby. I am so sorry about Wild Eyes and your journey coming to such an abrupt end. Your courage and achievement is an inspiration to me and many others and I am glad to see that you're taking the criticism from others as well as you are. My advice: ignore them completely, because their views and especially their comments are not worth the time it takes to read them. To me you're both an inspiration and a hero and I applaud you and your entire family for enabling you to try and achieve your laudable goal. Can't wait for a book or movie on your adventure to come out as I will be first in line to read or see it. For now, simply enjoy being home and know that you will always have a MAJOR fan in British Columbia. Cheers & Fair Winds.... always! Great post Abby..sounds like things are getting back to normal a little. The pictures are great....and Toby looks great rock~n the Zac shirt! Hope you all had a great 4th! What a wonderful post and how happy I am to read all about your adventures. The media can be brutal but I am glad that things have worked out for you and your family. I have nothing but the greatest admiration for you and for your parents. So glad you are home safe and sound. Congrats on your new baby brother. Time to relax and just chill. Have a great rest of summer. What a wonderful blog. Enjoy the time with your family. I'm sure you'll be off sailing soon. What happened to Wild Eyes? If she grounds somewhere, will you be able to go retrieve her? Nancy M.
Love this post! Congrats on your new brother. Happy future safe sailing adventures! Glad you made it home and thanks for the update. Hope you're not spoiling Paul too much! lol Congrats to your whole family on the birth of Paul. Abby, your youthful spirit of achievement is not alone. On June 27, 16-year-old Savannah Rickli of Colorado because the youngest female to complete the Pikes Peak International Hill Climb. That's a car race against the clock to the 14,110' summit in CO. She finished third in her car class. Like you, she had a dream. Welcome home to the land of freedom! You have a beautiful family. Everyone has a pretty face. Abby, now is the time to replenish your body and soul. Relax, you are home and safe. You have a wonderful big brother who can offer you good advice. Take advantage of him for as long as you can....who knows he may be off and sailing again soon too! Growing up in an unconventional way, as your family, on a house boat; it's not so bad, it is just difficult for some to relate to it. I grew up a little unconventional too, but nonetheless, very normal. Again, everyone has a pretty smile. great to see you home abby..love what you posted...i can only imagine with how much of everything that is going on is taking all your time...i look forward to reading more of your posts and keep looking forward..welcome home abby!!! Abby, you are the hope of us old timers that see so much immaturity and selfishness in parents and so much "me" in a lot of the young that are in the news today. Thank you for bringing light and hope to the world. As one of the previous posters said, do not worry about the negatives comments from people that will not even put a name at the end of the letter, these are small people that will not sign their names, breeding shows. I am glad that you had a good trip and that you enjoyed your time at sea with the "Ile de la Reunion", hopefully you can stay in touch with them, I know that they will say hello to you the next time you sail into the Southern Ocean; and, you will return!! If you have an EMail address that you could share for the "Ile de la Reunion", Osiris, Kerguelen Island, and Reunion Island, I would like to tell them all "Thank You" for taking care of you. I am glad also that you are united with your family, especially Paul, you will have a story to tell him when he is a few years older. Please, do not give up the dream, you are a beautiful young lady that has a great adventure behind her but has even grater adventures ahead of her. Never give up the dream, never stop believing in yourself, and never stop believing in the beauty of this world. What happened was all part of some plan that is hidden to us; all I know is that you touched many people as you shared your dream with us. You must believe that you will continue to touch unseen people and make a real difference in their lives even as you go on unknowledgeable of the effect and affect that your life has on the unseen. Abby, Please just be Abby and continue to follow your heart, we are here to support you and offer our congratulations on the adventure. You win just by attempting the dream, you touch so many people that are not seen and unknown to you, none of this can be, by any measure, considered a loss. Remember that there are those among us that are small, usually very small, that imagine greatness by tearing pieces out of those of us that attempt to live the dream; they attempt to belittle all the things that they, themselves, cannot dream, let alone accomplish. Listen to them only in so much as you can learn what not to say and what not to do. Pity them, for they lead shallow, unfilled lives and they die full of anger and always questioning "what if..." You are much better than these small people and you will be a winner regardless what they say or do. Help raise your brothers and sisters to see the same world that you do. They are all junior explores and your adventure will help them to see the world as it should be seen instead of what some of the small attempt to project. Take an interest in Paul, you and he are forever linked; one day, you should introduce him to his namesake, that would be a great honor for all three of you. Also take care of Katherine, she has your eyes, tell your Father and Mother to get ready for her. She is a precious gift and you are her guardian. Anyway, I have gone on too long, you are very special. I cannot wait for "more news", the next adventure, and the book. Abby, as always, GO GIRL GO!!!!!!!!!!!!!!! It has been a pleasure following your journey through your blogs and sharing them with my daughters. We have marvelled at your courage and ability. Thank you for allowing us to be a part of your fantastic voyage. You have a wonderful future, no matter what you choose to do. Your talents and courage will take you far. For now, enjoy this time with your loving family. Wishing you all the best. congratulations on the new family ,Paul-louis,a happy tough,little face.A good post Abby,we look forward to more stories of you,,and any thoughts on 'wild eyes',,the one left behind !!. abby, thanks for the news! Glad to hear that you are back home and it sounds like you hit the ground running once you were off the water! I bet your family is elated to have you home for your brothers birth! It's is kinda funny to remember where you were such a short time ago and where you are now. Was all that other real? Yes! You are amazing in so many ways Abby. Thanks for sharing your life with so many through your blog! glad you are safe. enjoy the R & R. congrats on the little one. have a great summer. Lovely to see you so happy safe and hopefully over your flu.Congatulations on the safe arrival of you little brother Paul.A tribute to your rescue. Keep dreaming dreams and work towards a stunning life full of fun and adventure. Be true to yourself through it all and everything will work out well. Good to hear from you! Well written overview of your trip home! Good to hear your home safe and all is well with the family. Hoping the best for you! Abby, you ROCK! Glad you made it back safely. The world needs people like you. So glad you're doing well and that you have a new, healthy baby brother! You have many things to be proud of and to be thankful for! Your mother named her baby after Paul Louis Le Moigne and you do not mention him on your post? What gives? Thanks for the blog, it was quite interesting! If it weren't for that high wave you'd be nearing Australia by now! But that's beyond anyone's control! You passed the half-way mark and did extremely well regardless! Thanks for the update! Congrats on your new brother. I saw your Today Show interview - good job. Take care, enjoy the creature comforts of home and family! Your story is so fascinating and truly full of good old fashioned Family love.I wish all of us were so lucky to have such a wonderful family. You may not think what you have done is worth all the media, but that is what makes it so great.... your are so brave and adventurous and You think it is normal. 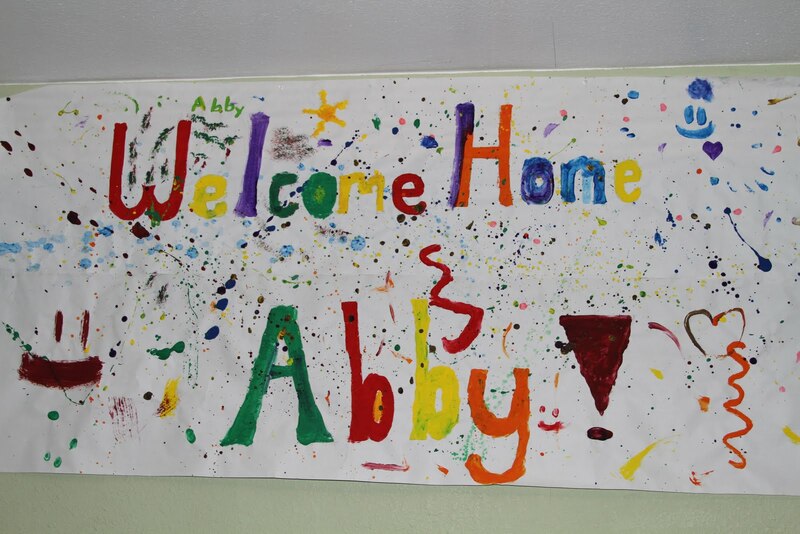 Welcome home Abby and good luck to you and your family in future adventures. All the best to you! Take care. 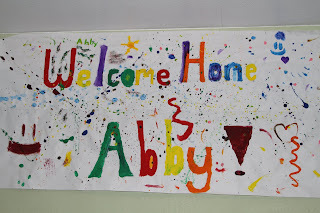 Welcome home Abby, so glad that you have got home safe & sound. Try to ignore the bad press, most daily ones go out of their way to find something bad and rarely print a story when somebody does something good. Thans for the extra long blog we love to read about you and your exploits. Hi Abby! Sure am glad that you are back home safe and sound. And congratulations on your new baby brother! What an adventure you've had! It must be requiring a big adjustment on your part to be home after being on your own and making life and death decisions! I have a question or two for you. On a subject that is probably painful, so I hope I don't offend. But here goes: What, if anything have you heard about the fate of "Wild Eyes?" Were you able to bring with you any of your pictures, i.e. flash drives when you abandoned her? And, is there any possibility that "Wild Eyes" might be found and that you could salvage some of your stuff? Horrible, sad questions I know, and I apologize if I have opened wounds... I guess it really was curiosity that killed the cat! I followed your story off and on, until June when you had to leave your beloved boat. I think what you tried to do was amazing! I have three very small children, and I hope that I can raise them to be confident, smart and courageous like your parents have done with you. I'm glad you are home safe....and that your sweet little baby brother has been born. He's adorable! God Bless you and your family. Congrats on the newest member of the Sunderland family!!! And what a nice post and pics to have from you, Abby! have fun with your time off . . . enjoy the family moments . . . and keep on being the strong, courageous, young woman that you are! Been praying for you & your family. Glad you are ok & hope you know God answered the prayers of the whole world when he allowed you to have more time here. I'm a day sailor & retired Navy guy who wants to go around the world too. Hope you try again. Please Abby, know this: while you were in the spotlight you were an inspiration to a lot of us ground bound folks! Fair winds & following seas! Wow, Abby! You look great, and I love the second picture! Thank-you so much for taking the time to post for your big fans like us who follow your blog! From a fellow Christian, homeschooler and teenage girl (middle kid of 7! ), welcome home!!! 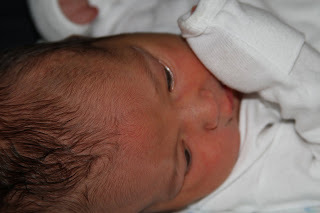 and a BIG congratulations to you and your family on baby Paul (BTW< he is adorable!)! Have a wonderful day and I am really looking forward to reading more about your adventures on your blog (and maybe a book someday? :)! Im proud of you kiddo. As I have said in previous posts, keep the faith in Jesus Abby. Put all your hopes and dreams and ambitions in his hands and you will accompish anything! Keep us posted on the little brother. Thank you for the update. Keep your dreams alive and take us with you on your next adventure. What a sweet baby - I hope his big sisters (both of them) teach him how to live for his dreams! Abby, I think Katherine is so worried about you leaving the house, is because when you turned on your IPERBs the news made it seem like you were in the water and wild eyes had been lost at sea. They said that you were also lost at sea. I think that you aren't just Katherine's sister, you may also be her best friend. I don't know if you and Katherine had a talk about the day your IPERBS were activated and what the news had said. You need to let her know that nothing is going to happen to you. I just thought I'd let you know. Maybe you and Katherine can spend some quality time together doing something that she likes to do. It's just a couple of thoughts. Thank you for sharing your Welcome Home cake, your baby brother, your sister Katherine and your adventures with us. Take care Abby. I am blessed to hear your home enjoying the family and your newest sibling! Keep in mind Jeremiah 29:11. God does indeed have a plan for you sweetie. I have enjoyed reading your blog since you started your voyage. You have a wonderful, easy style of telling your story. From the beginning, I was amazed at your strength and courage. When I first heard that you might be "lost," at least for the moment, tears came to my eyes. You are so bright, intelligent and brave, that the thought that you might be lost was very overwhelming. That would be a waste of so much talent, because you have so much yet to give the world. I know you will have many successes in the years ahead. It was wonderful to hear that you had been located and would be rescued. Congratulations to everyone who loves you on your safe return. Your little brother is precious, and so is your sister. Abby, it's good to hear that you are home safe & sound. We love the pix you've shown us, especially you with Katherine and baby Paul. What a wonderful homecoming gift. Katherine must be very happy to have you back, and you must be enjoying some R&R now that you're back on solid ground. Enjoy this time with family & friends knowing that you have many admirers all over the world. Your last post at sea was June 13 Aboard The Ile de la Reunion....and as you have written Abby a lot has transpired in your travels since then. And when you were not available to do so we thank your family for keeping your blog followers "in the loop" at times when we know their thoughts and priorities were elsewhere. That's a great photo of you and Paul-Louis in your arms. And I was so happy to see that you did better than my suggestion of getting a window seat on the plane to Paris and actually visited the Eiffel Tower with Zac. Abby hopefully your time spent in "the office" will be short lived but for now you can hang your "shingle" outside that office door - WORLD ADVENTURER ON DUTY...BY APPOINTMENT ONLY. Enjoy helping mom at home and hugging Katherine. Hi Abby, I can't beleive that I said thank you for sharing your Welcome Home cake with us, I meant your Welcome Hone sigh that your family worked so hard to make for your return. I just wanted to clear that mistake up. As soon as I got in the door, I checked your blog. As soon as I had a chance to clean my mind, that when I realized I made the mistake. Thank you very much for the last and very interesting post. Once again, you did a great job of explaining all the activities that you took part in. It made for some enjoyable reading. At least coming home under those conditions you were able to enjoy yourself, and I thought that picture of you and Zac with the Eiffel Tower in the background was great. I’m really glad that you are home and comfortably settling in. You’ve got a great family behind you, plus thousands of faithful fans. Take good care of yourself and keep up that great smile. I enjoyed all the pictures and look forward to hearing more about your return. your little brother Paul is a handsome baby. Welcome to the exciting world, little Paul. You are a blessed boy, and so are all of the Sunderland children. Your parents are also blessed to have such a wonderful family. We know God will lead and guide you into other great adventures, and you will be blessed with many precious memories as you walk the paths in your life. Thanks for such a remarkable blog. It's well written and maintained, and one of the best out there. It's a joy to read, dearest Abby. strength, peace, and comfort abide with you and all of the family. I like your baby brother. Welcome Home! Many congrats on the new addition to your family. He's adorable. I am glad you had a safe trip home and are settling back in nicely. Thanks for the update, Abby! Get some rest, enjoy the family, and don't worry about the rest of the world for a while. And get over that summer cold (they're so frustrating!). I started listening and reading about your adventures from the beginning of your journey and found it interesting for a young girl to take in this fascinating journey. Thank you for sharing your story. Glad you made it home safe and sound from your close call. The Angels were watching over you. I love to read true adventures of people and their amazing journey's. Not sure if you have heard/read of Colin and Julie Angus from Vancouver Island, Canada. They have some amazing and fascinating stories in 5 of their books. Mr. Angus was named the NG adventure of the year in 2006. One of my favorites is "Rowboat in a hurricane." Their web site is. www.angusadventures.com. I have heard them in person as they were doing a book tour through our part of the world here in Beautiful British Columbia, Canada. I would think some day you will write a book on your adventures...enjoy your time with family and your new little bundle of joy. "Travel is inspiring and empowering, and quite often a fascinating journey into the human spirit." God Bless you and your family. Hey Abby girl - so great to read all the latest news and catch up on your life. So many exciting things going on, between your long trip home, the media, trip to NYC and the Today Show, not to mention a stop at the Eiffel Tower and of course the debut of your new brother. I am really proud of how you've handled yourself considering all that is happening in your life. It would surely be enough to send anyone into a tailspin, but you once again have proven your emotional maturity through your behavior and response to all this. Even though you miss being on Wild Eyes, I hope you are able to enjoy being home. There will be more adventures and you will be setting out soon I'm sure. But for now I'm sure your mom, dad and whole family is happy to have you back with them. You have accomplished an enormous amount for someone so young and you have your whole life ahead of you to take on the next adventures. It's good to see you made it home safely, and appear to be in such good health. I'm afraid I missed the network premier; there's not a lot of television available in middle of nowhere, Missouri. Big congrats on your new lil bro! I'm sure you will help make a very good example to him of what a person should really be as they grow up! Congratulations, again, Abby. As I see it, you haven't failed. You've only just begun. Lol, that is great the press asked you about Twilight. What the heck does that have to do with sailing, or your trip?? Too funny! Wow, we can hardly believe you are all the way back here, and it was great to hear just how you made it. After following all your great days on the sea, it is so wonderful that you understand that we really care about you, and we are grateful to hear you are safe, your family is at peace, and now celebrating Baby Paul's arrival. Your family has so much to be happy about, and you really must understand how lucky you are to have this amazing family, and know how proud of you they are. Our family can hardly imagine what it must be like to go where most can't even imagine going...we can't wait until you are able to tell your whole story. Just know we are so happy to have you back. We know another great adventure awaits you someday, as well, since your dreams will keep carrying you on. WELCOME BACK ABBY! YOU'RE THE BEST!!! It is so enjoyable to read your blog. Look forward to more to come. It's great to hear from you, Abby. It's such a blessing to have you back home, safe and sound. Congratulations on your new baby brother. That's a beautiful pic of you, Katherine and Paul. I'm pleased that you've had a relatively enjoyable trip home, after the unpleasant circumstances that separated you from Wild Eyes. As they say..."Paris is beautiful this time of year." Too bad that you didn't have a few days there, but it's not going anywhere. It'll still be there when you want to go back. Hey, and how many people can say that they've visited Reunion and Kerguelen Islands, not to mention BBQing at sea with a baker's dozen of French seamen. Please keep your blog going, and let us hear from you regularly. All of us, your fans, think of you and your family as part of our family now. We know that your future is going to be awesome. We want to once again share that experience with you. We love you. Only one question: do you know anything about Wild Eyes? Is there any hope to recover it? G'day Abby, good to see you home safely with your family, at last. Welcome home. Very nice story and picts. I 'am so happy to see that everything is all right now for you and your family. One question: You didn't spent a lot of time on the Kerguelen, but what did you do when you were there ? Do you know that when you took the photo with the Effeil Tower, you were at less than 50 meters (on the right) of the national marine museum about sea and ships. Too bad you didn't have time to see it. So glad to hear from you! I love your attitude and they way you handle people who don't support you or your family. I know there are a lot of reasons why people don't support your efforts, but really, my sister signed for my nephew to enter the Army at 17, he is at boot camp right now. One year age difference and is off for a short time then gets deployed. I don't see much difference there - maybe that is a stupid comparison but that is what kept going through my head as all these judgmental people would give their unasked for comments. Anyway, I'm glad we got to hear from you. Hope you are getting time to spend with family and friends. We love seeing your pictures. I don't even know if you read these or not, but do you have video of your trip? I would LOVE to see some of that - or if you do are you planning on a DVD? Can't wait for your book! What a cute little guy! I can't believe your home either Abby, and I'll never forget when you were out of touch, it was my 25th birthday, and what a crappy present! But I am glad you are home and safe. It's strange how long you were gone, but how quickly you came back, although I'm sure friends and family felt it was too long. You are a very driven young woman, and you have many supporters. Take your time figuring out YOUR life and goals, and never settle for just one dream or one goal, you have enitrely too much intelligence and motivation to stop short of your dreams. I think YOU AND YOUR WHOLE FAMILY, are amazing people. I only wish there were more parents like yours and more sons and daughters like you and Zac. Like I said, I must read Zac's blog now, so tell him to check his comments when he gets bored! BEST WISHES ABBS!! Welcome Home, Abby. I'm glad to see you back safe. It was great to hear from you. Sounds like your getting settled back in. Congratulations on your new brother! Very cute. Please keep us posted. Take good care of yourself and write when you can. Always enjoy reading news from you! So glad you are safely home and spending time with family. Congratulations on having a new little sailor in the family! And what a great big brother Zac must be! It's great to see how much support he has been to you. Wishing you joy and peace. Thanks for the great blog and pictures, sorry you didn't get more time to enjoy the beauty of Paris. Thank you very much for the post & pictures. I must say though, little Paul looks a little upset :-) Well-- what can we expect huh? He isn't even a week old yet is he? I'd be a little grumby too if someone took be out of my 98.6 degree comfort zone! Anyhow you look great! God bless you and you family and especially lil' Paul, my friend. Plus, have a super blessed week! UPDATE US ON YOUR TREASURED "WILD EYES" SOON ABBY!!! I'm glad you are home safe. I hope things are going well for you and it seems that you are blessed to have such a great family! Keep dreaming big; you can do anything! Much Love. and congrats on the new baby. must have been exciting times for you. go on writing girl. the adventures you write may not be about the sea or sailing at this time but the way you write them...i know that many will still be excited to read, hear from you and be updated on how the young girl who is determined to live her dreams is living her other dreams, on land, on dry safe land. more power to you abby. i know you will not only conquer the sea...but also life. keep the faith as there are many like me who believed in you, who believes in you and who will always have faith in you. thanks for being an inspiration to many. Great post Abby. I've been watching for an update and figured you were more than busy - you were! Welcome home, congrats on your new brother. Looking forward to reading more. You're a great person with tons of common sense. I'm pleased that you came through this in one piece. Wishing you well for the future. Ala sante eleia casasonto eleia kia satay! So good to know you are safe and sound at home now after your monumental effort! Congrats on the new little brother! I'm wondering if you have any more information on what happened to Wild Eyes after you left her. I have read conflicting reports that she has either sank, is drifting towards Australia, and that someone went out and was towing her back to an island. Also, just out of curiosity, what did you do on Kerguelen besides transfer boats? Where there certain protocols you had to go through as a rescued sailor? to the fullest. Congratulations on your accomplishments and best wishes for a happy and successful future. You are home safe and sound with all the memories that folks many years your senior will never experience. Not much I can say except "Job well done" . I'd bet there will be other seafaring adventures and stories to tell. You are a remarkable young lady. I am really sorry your adventure turned out the way that it did. I have known the disappointment of failed adventures and I am sure mine have pailed in comparison to how you must have felt. I am also sorry that the naysayers of the world have dampened the spirit of your adventure. Please know that they are merely wannabees that would never attempt anything even close to what you have accomplished. I will truly miss following your progress on this particular adventure but I rest easy knowing that this is not the last we will hear of Abby Sunderland. You are a remarkable person that has already touched many lives. Your many fans, including me, will anxiously await to see where life will take you next. As always, go Abby go. May God bless you, guide you and keep you Abby! Good stuff, get back in the saddle soon. Congratulations Abby and Family!! Such beautiful pictures. Abby you look as beautiful as ever in the pictures. Your little brother is soooo cute. God Bless him. Nice to see you happy and enjoying your trip back home, of course I know you could have done without the cold. Thankyou for your update and of your family. Warm greetings from us here in Philippines! See how God have blessed you and your family so much. Paul is so sweet and cute! After your harrowing days in the Indian Ocean, God and the people who love you so much is now giving you PEACE. So enjoy the rest. Keep growing for the next adventure. Rest assured, we have a special place in our hearts for you and your family. Thanks for the wonderful blogs. Best wishes and prayers for you, your parents, your siblings and of course a special intention for newly born Paul. Keep blogging. You put the sun in our hearts! It's been an honor following your adventure, and I hope there is more to come. Good luck and all the best, keep sailing on! I admire how you have handled your homecoming, under circumstances very different from Jessica's. She handled it extremely well and with much grace and humility, but by that stage all the knockers had retreated to their holes in the ground, and she was a 'successful celebrity'. Your story is different, and yet you appear to have your own grace and dignity, holding your head high as you endure your knockers and critics. Well done. Dear Capt. Abby, I'll wager you think about Wild Eyes a little more often than me. Of course our family thinks it is wonderful that you are safe & home now with yours...but me, I'm restless treading water. There's No way but to locate Wild Eyes. Salvage her, refit and then you resume command and finish the original plan. Period. Just gotta skipper! You mentioned your old bed, that's nice but it's only a place to think and plan how we can gitRdun. I know...I know....it's tough out there little guy. And you JUST arrived! The expression on your face in that first photo says it all. Lots of hugging, kissing and smooching going on ...everybody crazy about you...family flying in from Paris to see you...people from all over the world sending their love your way. And you're wrapped up so tightly in a white blanket that you're sure you left your arms back at the hospital. Get use to the excitement littlest bro...you are a SUNDERLAND. Paul-Louis let's do lunch sometime....and I will tell you ALL about it. Abby I'm glad you're home with your family and congratulations for a new baby brother/sister. Your adventure is like a movie in real life. There is so much emotions in the air when suddenly you're gone. Now you're safe and in good shape. I would be glad to see you in another seafaring adventure visiting different countries worldwide. That I think is cool. I hope you consider. God bless you. Glad you made it back safe. You know I think your brother wanted you home to say hi and see him come into the world. Things seem to happen in strange ways. Hi Abby, Glad to here you are safe and in good spirits, sorry you and wild eyes are not still going for your goal, Good luck your in future endeavors! Catamaran sailor Rob, Dunbar Nebraska. :D congrats on the new little bro!! All in all i guess i can only be thankful that you could take us on the journey with you!! @ John/GlobeMasterOne... I so LOVE your posts! You are a hoot! Paul-Louis will have his hands full, that's for sure! only great souls can identfy a great spirit. Let the ocean's gods and spirits lead the way. Hi abby- I'm glad You're safe. Like I said on January 1 keep following Your heart. I would love to crew for U sometime. PS I have no idea why a duplicate comment to Your blog on july 3(and one on a friend's blog the same day) seem to have evaporated into thin air. If it's there and I'm not seeing it,sorry. Welcome home, Abby. Glad you made it back safely. Sorry you lost your boat. Best of luck in your future adventures! I would like to offer out to you some insights. Abby, at this time in your life you are on a roller coaster. As you go through your day, one day at a time, and experience the highs and lows; this is called grief. You have lost something so significant in your life, Wild Eyes, that you need to respond to your emotions as if you lost your partner in life. The journey through grief, loosing something/someone significant, takes about a good year, from start to finish. Grief counselling speaks of using creativity and self expression as a force to bring about healing. You either need to write, such as continue to blog, write in journal and use all other sources of artistic expressions within your self to continue the healing process. You lost your whole self when you lost Wild Eyes. You are young, but you are a human, just a young human. You will need to go through the steps of grieving to deal with and heal from the inside out. Don't deprive your self of this time in your life by trying to hide your pain of your great loss. You lost your whole world in one moment of your young life. I just feel the need to let you know that, it is not only normal to grieve, but it is the only answer for the future. Keep up with your blog. those who are really interested with your life, will want to go through this process with you. So keep writing, don't pull completely away. Go through the grieving process one day at a time. Let us go through it with you, let us feel your pain and loss with you. It takes time to heal. You'll feel better, one day at a time. Remember; it takes about a year to go through the grieving process. You are so funny! After sailing halfway around the world, stranded in the middle of nowhere and rescued, what is the first thing you think to do for fun when you get to the island with your brother -- rent a sailboat! Very amusing. I'm so glad you are safe. Take care. So pleased to hear you are safely home and enjoying the new arrival to the family as well as your very own bed ! Thank you again Abby for doing what you have done, for being who you are, and for sharing this all with a world in need of positive examples. May you be blessed with the good fortune to continue being one of these positive examples for all generations on our planet. I´m glad that you are back home and safe. Congratulations to your family and welcome to the world little brother! Remember that God has his own plans and, maybe, this trip was His, because He wanted us to meet you and wanted you to be an example to all of us. But the next will be yours, and then, you will be to port of our hearts. I´ll be following your blog. I wish you have a happy journey in your life. Can you have some sweat shirts made up with your logo on them? As I'm sure you are aware of it gets cold down by the sea shore. I'd buy a couple, one to wear while the other is in the wash:-) Thanks! God bless you and your day! I love you!! You're the greatest!!! Welcome home! Great reading and such nice photo's. Congratulations to your family to the new little boy. He looks so cute. Great idea to see the Eifel Tower while in Paris. Rest now and enjoy being at home. You have a lot to look forward to in the future. Welcome home! Welcome too to your new baby brother. He is a beautiful baby. I hope you soon get over your cold and you are then able to give him lots of ((((huggles)))).You have certainly made an impact on many people. You are such a brave and valiant young woman. Well done you for taking up such a BIG challenge and doing your utmost to fulfill it. Take care of yourself and enjoy your family reunion. Keep up the spirit Abby. Glad you are back on our great country and that you doing well. Just keep astounding the media, they don't know what to do with a happy person. Now that you are Safe at home. I ask you to do 3 simple things every day. 3rd is for Catholics only. 1. Thank God for seeing you through a difficult journey and dis-masting in the Southern Ocean. As I am sure you realize things could have been different. 2. Say a prayer for those in Davy Jones' locker. Many Brave mariners didn't make it around both horns. The way you did. 3. If you are Catholic a couple quick hale mary's and you are good to go. totally forgiven for any bad thoughts you may have endured. In closing ignore critical words from non sailors. Revel in the respect (AKA respek yo) of those who sail and know what it is to be cold hungry and scared. You are an example to your generation and your gender. Glad your home safe Abby, I have followed your trip from the beginning and read your blog first thing every day.....when I heard you were lost at sea I was really really worried and was very relieved when they found you. You have had the adventure of a lifetime and although there are negatives that you have experienced, those bad memories will fade and you will be left with only good ones. I was so sad that your boat had to be abandoned, it must have been very very hard to leave it. I am a sailor and I don't think people realize the bond sailors form with their boat. It must have been heartbreaking to just leave it in the middle of the ocean. Ignore the people who are negative and concentrate on the positive. I am 58 and although I dreamed of having an adventure like you have, I was never able to as I gave in to responsibilities and allowed things to become way to important when I was younger and then found out that as you get older and you are able to take the time to have that adventure, your desire to do it has left. Hang in there, be proud of yourself and continue to live life the way you want. You are an amazing person. Good luck and good sailing. Welcome home. Your brother is really cute. By the way, did you ever catch a fish on your journey? Well done Abby. I have followed the entire journey from the very start. I would tell my friends about the web site and the blog. It was fascinating to follow the adventure. I cannot believe how strong you are. I mean it is one thing to sail a boat, but to sail a boat in the wild open oceans and being so far from home in the middle of nowhere - the bravery you exhibit is really a testament to your character and gives all of us a chance to see ourselves and our lives with a bit more clarity. Even if I could sail, I could not have done what you did. You are true and real adventurer and I just know that this story is not over. I can only imagine that you will conquer the oceans again. Well done and great story. Your family is very proud of you I know. And, you should be immensely proud of yourself - what you accomplished is really huge - for any sailor, especially someone your age. All the best and we will ALL look toward the future and your next adventure. It's good to hear you are back home safely and able to enjoy the recent expansion of your family. I haven't followed your story closely, but whenever anything new was covered by the media I tried to keep up with it. I was saddened to hear that you had run into some distress. Although you were unable to complete your circumnavigation, I wish you the best in your future efforts (should there be any). Congrats to your family on the new addition! You are an amazing and brave girl Abby and hats off to your family! You are very lucky to have such a wonderful supportive family. Your story fascinates me and I am a huge fan of you and your family. Great update... thanks for sharing all of your experiences (so far!). There's a lot of folks that'll stay tuned to your updates 'cause we all know that there are many more experiences for you yet to come. Making memories... that's what it's all about. I am so happy you are finally home safe! I wanted to know if you are going to go sail again. And how does it feel to be at home, do you like traveling in your boat or staying at home better? Great going Abby. Like most folks, I have been with you via your blog for quite some time. I know how disappointed you are, but the ill fated outcome was circumstantial and doesn't reduce the size of your heart (or huevos for that matter). I like to consider myself an adventurous sole for the most part, but I litterally shake my head with admiration for you whenever I think of all you endured. You were seriously like a gladiator out there against the ocean. Your boat lost the battle, you didn't. Keep in touch Abby. I feel like I know you, although I don't, but I do not want to say good-bye. I'll keep checking the blogs, and my best to your awesome parents and the rest of your family, especially that new little fell'er. Gary from Folsom, Ca. So glad that you're home and safe. A famous guy once said that everyone gets their 15 minutes of fame in their lifetime. This is your time and so enjoy it. It really doesn't last very long until that fame moves on to the next person! You'll see!! Glad that you are home and safe with your family. Have you made any plans to repay the Australian people who risked so much to save you? It would be a nice gesture. 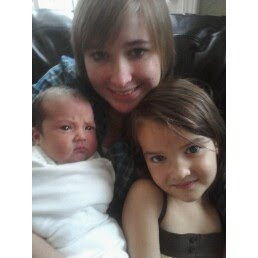 Abby,I just love the picture with your sister and baby Paul. Kickin' it and tryin' knots sounds boss too Skipper! God Bless you my friend! AS a parent of young children, I am continually aware of their vulnerability and of my responsibility to protect them. .... The toothless, self-regulating ASB needs an overhaul. Aren't our children more important than making money? If not, maybe it's time for governments to step in for the sake of children. Welcome back Abby! You did an amazing job and accomplished a lot. For those that said you were too young to do that, forget about them. You've done more than what they have done in all their years, and certainly more than when they were your age. And your parents and family and friends support is great! I am taking sailing lessons myself and can only imagine what you have seen and gone through! I'm looking forward to a book from you if you do one! Thank you for filling the empty spots in the narration of your adventures. Very charming pictures of sisterly brotherly love and affection; [in a lower voice] can we have a picture of your dog too? You are an Adventuress that will go down in all the sailing annuals for all History. Wellcome back from you supporters in Arizona.Glad to see you are safe and now able to hold your New Baby Brother.Remember a famous author once said""Twenty years from now you will be more disappointed by the things that you didn't do than by the ones you did do. So throw off the bowlines. Sail away from the safe harbor. Catch the tradewinds in your sails. Explore. Dream. Discover". SAIL MAGAZINE WANTS TO HEAR FROM YOU! If the purpose of your comment directed TO Abby was to “stir the pot” between Abby and Lyall Mercer....you FAILED my friend. The only "conflict" here is with YOURSELF. The article which Mr. Mercer wrote for the LIFESTYLE section of the newspaper had the heading "TEAR DOWN SMUTTY BILLBOARDS" and the archive summarizes: "Everywhere we go we're bombarded by sexual imagery against our will. I want my children to keep their innocence and enjoy their childhood". Mr. Mercer is speaking directly here of his SIX year old child. Sad that you seem interested in the "protection of children" yet you are openly trying to humiliate a 16 year old girl...Abby. As I said you DID direct your "comment" directly TO Abby after all. Anonymously no less. I am glad you are home now. So I read. Hi Abby, so glad you are safe. I will buy your book when you write it, though I hope you don't stop blogging. The baby is cute as is the rest of your siblings. I am a newcomer to your world but have been so moved by your ambition, motivation and confidence. Looking forward to the plans you have in the future and I wish happiness and love in the ways of the angels. Congratulations on your new little brother! And welcome back home. I look forward to hearing more about your adventures from your trip. Get some rest and feel better soon! Abby, you are amazing to me!!!!!!! Somebody said you have a horse to. What kind is she and what is her name?!!!!!!!!! I am thrilled to read your blog again, it has beens so long! Your writing style is fun and I always laugh a couple times reading it. I'm glad the press wasn't too bad. They have been somewhat of a disappointment during this whole thing I think. But I guess it comes with taking risks and doing extraordinary things. You have handled it all with class and style Abby. So has Zack and your whole family! I'm sorry about Wild Eyes. She was a tough little boat and you took care of each other when you needed to, right up to the end. But she did her job right, getting you home. She will be missed. But you are our Star Abby! Please keep us posted on what's next for you! And congratulations on your brand-new baby brother! So what sails did you have up when you dropped the rig? You said they filled with water?? We'd be curious to know! Glad you're safe!! Good thing you're not in the southern ocean right now under Australia! Quite the system rolling through there right at the moment! Not sure I would want to be out there at this time of year!! This whole dismasting could be a blessing in disguise, dear Abby! can;t wait to hear waht is next on the horzion for you! !...go girl go!! Thank your parents and yourself for showing us there are little good angels among us, a little bit walking, a little bit sailing, but allways embracing the World with those beautiful eyes and your smile! Now that you are in the spotlight, you have the means to give example to the youth, in good manners, in healthy lifestyle, and to show the ways on creating a meaningul life to all, to invite people to be friends to the nature and respect the nature and the planet, to live in harmony and give due respect to the miracle of life. Take a rest, regain strength, but never fade out, couse I feel you have a mission! Please! You guys, blog readers, admirrerers, supporters, will never know where our Abby was despite the internet maps, before finding a globe a bigger one, arround 15 inches in diameter, take it in your hands, feeling it's weight and the waste size of the seas, and navigate your eyes, way down south to the Antartic region of the Indian Ocean. Now imagine the winter and the seastorm as if you were sailing arround Alaska in December. I am glad that her mast broke, just in time, when the ships were still in the nearby, the storm was easing on her and Kerguelen was within reach. Thank to providence for sending you the big wave that saved you from the mouths of the sailors shrine! You were chosen to survive, and that is why I feel you have a mission. Good winds in your life beautiful skipper! HELLO ABBY, I have been away and just logged on to check on your up-dates. Loved all your photo's and great to read your latest news. Thank you. You little baby brother looks beautiful, must have been hard for you not being able to have a cuddle because of your cold. So glad you are now home and able to enjoy doing all the usual things you have been missing. Abby it it would make an incredible movie. Anyone can go around the world but to battle the seas like you did and get through it in a boat that was demasted, now that's another story. Keep smiling princess and I'll wait to see you on the big screen. Dear Captain Abigail and true and faithful followers, Ahoy! This is what I wrote to send into SAIL magazine for the 100 words on my thoughts about Abby. I hope you like it and of course if you think you can do better ...? By all means, please, please (pretty-please:-) do! "She set sail with Wild Eyes in pursuit of the life-long dream of sailing around the globe. The journey half over, the vessel dis-masted; voyage over and the clobbered ship along with the dream sank. And if getting hit by a massive “rogue” wave wasn’t unfortunate enough, now came the blows of an unmerciful media with claims that the Skipper was too young; that the parents were irresponsible and unfit for allowing their LOVE to chase her dream. Now she’s home again, safe and sound; unscathed by both the sea and the media. That’s what a Captain is made of!" Hi everyone - I'm back!